Are percentages really that hard? Now, journalism has a reputation for misreporting scientific studies, what with all that complicated mathematics, statistics, probability, and the drawing of logical conclusions, but this is ridiculous. After all, “per cent” sorta implies that the numbers should add up to some number relatively close to 100, and I think that most people, at least those skilled enough to get jobs in tv, should be able to do simple addition without having to resort to appendages. Exhibit 1. For the tv-mathematicians, let me point out that 60 + 63 + 70 = 193, not 100. 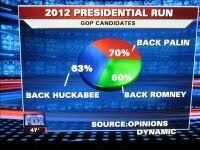 Source: Truncated thoughts, Math is a tool of the liberal media, 2009-11-25. You would think that after an error like this, someone would be more diligent in fact-checking and/or proofreading. But you’d be wrong. Exhibit 2. For the arithmetically challenged, 59 + 35 + 26 = 120, yet again not 100. Source: Truncated thoughts, Math: still the tool of the liberal media, 2009-12-12. I can overlook the occasional mistake (particularly if it’s my mistake). But in a relatively high-profile venue, repeating the same error within a month? Arrrgh. images: these are half-size local copies to avoid hot-linking the originals at “Truncated thoughts”.